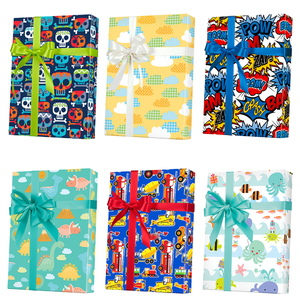 Bring a bunch of gifts to a party wrapped in adorable Kids Gift Wrap. Kids gift wrap can be used on toys, clothes, or anything you may need for a baby. Many sizes available, full ream, ½ ream, cutter box and jeweler's rolls. Choose from over 50 patterns. Baby Gift wrap is for boys or girls, there is pink, blue, yellow, green and more!! You will find giftwrap from Jillson Roberts, Shamrock and Sullivan.